Do you know what all the markings on your tyres mean? 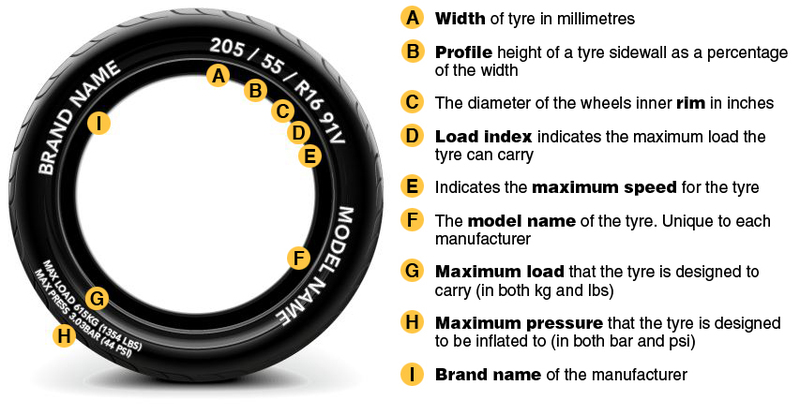 If you’re in the market for new tyres all of the variables in tire specifications and the confusing jargon you might hear from tire salesmen or “experts” might make your purchase rather stressful. Or maybe you just want to fully understand the tires you already have, the concepts at work, the significance of all of those sidewall markings. What does all this stuff mean in regular terms? In this article, we will explore how tyres are built and see what’s in a tyres We’ll find out what all the numbers and markings on the sidewall of a tire mean, and we’ll decipher some of that tyre jargon. By the end of this article, you’ll ­understand how a tyre supports your car, and you’ll know why heat can build up in your tyres, especially if the pressure is low. You’ll also be able to adjust your tyre pressure correctly and diagnose some common tyre problems! The tread on your tyres should never fall below 1/16 of an inch (1.6 millimeters) in depth. If you regularly drive on slick, wet surfaces, you’d be even better off with twice that much. You can buy a gauge to measure the tread depth the way the professionals do, but there’s an old trick that will give you a rough idea of how much tread depth you have left and it won’t cost you more than a penny. Not all problems with the tyres are going to be in the tread. They can also appear in the sidewall. Fortunately, it’s easy to do a visual check of sidewall problems. Look for tracks or cuts in the sidewall — grooves that are distinct enough to be visible to the naked eye. This could be a sign that your tyre is developing a leak (or worse, that it’s nearly ready to blow out). This is definitely something you want to avoid. So if the cracks in the sidewall are starting to look serious, Better safe than sorry, as they say.